I have used a very wet wash of Sap Green mixed with Aureolin Yellow to glaze over the green areas of the leaves. When this is dry you can add more details if you like. 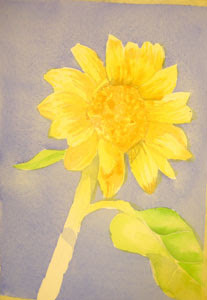 I want the sunflower head to be the focal point, so I am saving my detailed brushwork for that area.